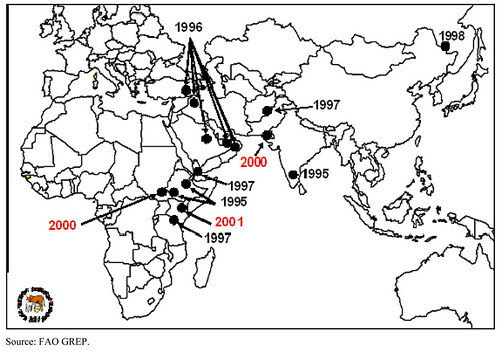 Last known occurrences of rinderpest since 1995. IFPRI Discussion Paper 00923, November 2009, ‘The Global Effort to Eradicate Rinderpest’ by Peter Roeder and Karl Rich, 2020 Vision Initiative, a paper prepared for a project on Millions Fed: Proven Successes in Agricultural Development (www.ifpri.org/millionsfed) (illustration credit: FAO GREP). 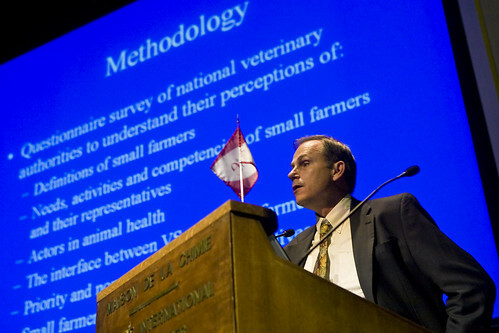 Jeffrey Mariner, former advisor for special action areas to the Pan-African Rinderpest Campaign and current senior scientist at the International Livestock Research Institute (ILRI), based in Kenya, is one of several authors of a paper published in the current issue of Veterinary Record on the subject of the rising importance of building a systematic program to eradicate a goat disease known as ‘peste des petits ruminants’ (PPR), or goat plague. 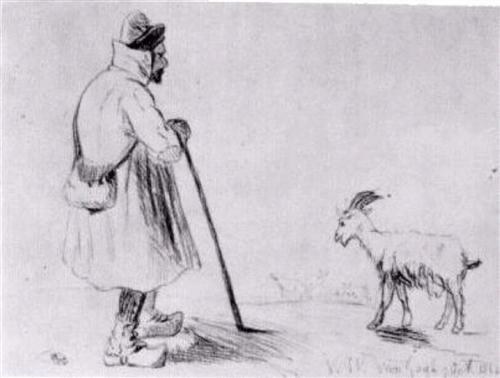 The editorial in the Veterinary Record explains why goat plague is replacing cattle plague among the world’s verterinary researchers. ‘This week saw a landmark in the history of the veterinary profession and, more specifically, its management of disease threats to food security. The Food and Agriculture Organization of the United Nations (FAO) announced on June 28, 2011 that its member countries had passed a resolution declaring rinderpest to have been eradicated globally, building on an announcement in May that the World Organisation for Animal Health (OIE) at its General Session had passed a resolution to the effect that all countries in the world had been formally accredited as free from rinderpest. ‘These events mark the fact that the virus is no longer present in any of its natural hosts on this planet. No longer is it a cause of disease or a constraint to international trade. What is not generally appreciated is that the eradication of rinderpest has yielded benefits that surpass virtually every other development programme in agriculture, and will continue to do so into the future. For example, a preliminary study in Chad shows that over the period 1963 to 2002, each dollar spent on rinderpest eradication led to a benefit of at least US $16, a conservative estimate that only takes into account the benefits from reduced cattle deaths and resulting herd growth, without including secondary impacts on the economy as a whole (Rich and others 2011). 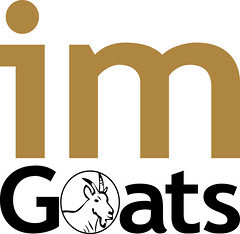 ‘Building on the dramatic success of the global effort to eradicate rinderpest we now wish to draw attention to a related but significantly different morbillivirus disease, peste des petits ruminants (PPR), also known variously as goat plague, pseudorinderpest, pneumoenteritis and kata. A comprehensive review of the disease by research scientists at the Institute for Animal Health Pirbright laboratory (IAH Pirbright) is published in this issue of Veterinary Record and explains the scientific basis for considering eradication (Baron and others 2011). ‘Until relatively recently PPR was considered to be a parochial disease of west Africa; however, its range is now recognised to affect most of sub-Saharan Africa as well as a swathe of countries from Turkey through the Middle East to south Asia with recent alarming extensions into north Africa, central Asian countries and China. 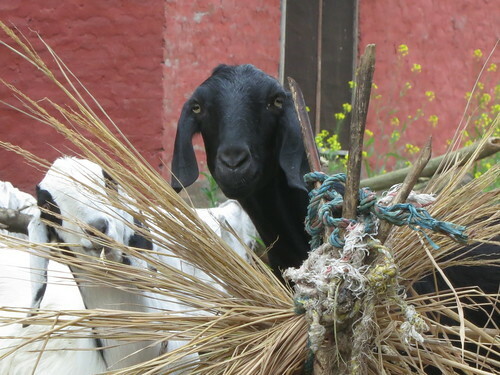 Capable of causing very high mortality in susceptible goat herds and sheep flocks, PPR exerts a major economic impact on farmers and their families dependent on small ruminants. 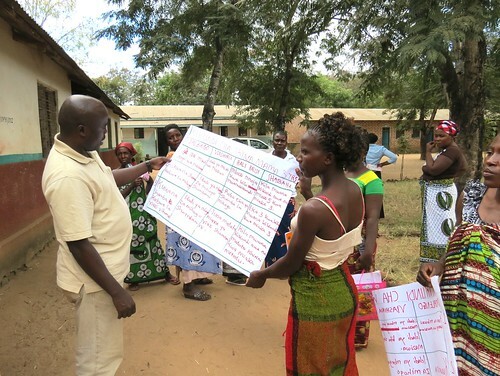 There is a growing appreciation that PPR is a most serious constraint to the livelihoods of farming families and to food security in affected countries and that its control warrants significant investment. An additional concern is the lethal nature of PPR infection in wildlife species, many of which are endangered or threatened, including gazelles and mountain caprines. Until recently, losses were apparently restricted to extensive wildlife collections in the Middle East but now outbreaks are being recognised in free-ranging species such as the Sindh ibex (Capra aegagrus blythi) in Pakistan. It is probable that many cases of wildlife disease have passed unnoticed in remote locations. Read a paper by Peter Roeder and ILRI scientist Karl Rich, The global effort to eradicate rinderpest, IFPRI Discussion Paper 00923, November 2009, prepared for the project on Millions Fed: Proven Successes in Agricultural Development. 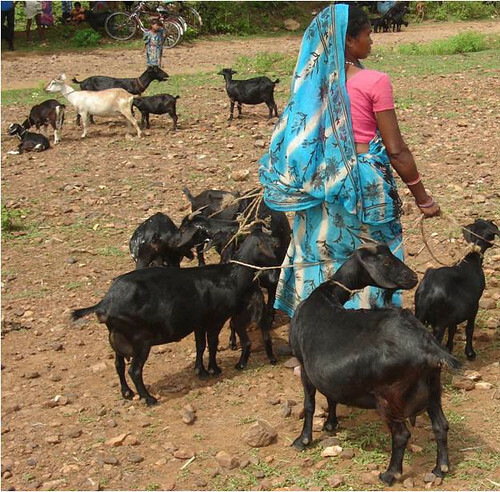 A woman in Jharkhand, in eastern India, tends her goats (photo credit: BAIF). 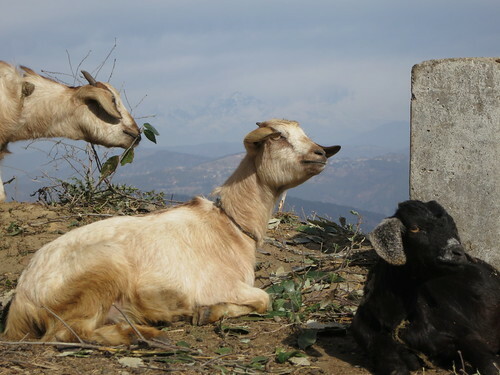 A new report from the International Livestock Research Institute (ILRI) highlights the potential for the livestock sector in the state of Jharkhand, in eastern India, to move millions of people out of poverty. Jharkhand, formerly part of Bihar, was created as a new state in 2000. Despite having rich mineral resources and some of India’s most industrialized cities, its population of 27 million are amongst the poorest in India. Some 26% of the population is classified as ‘Scheduled Tribes’ and a further 12% as ‘Scheduled Castes’. 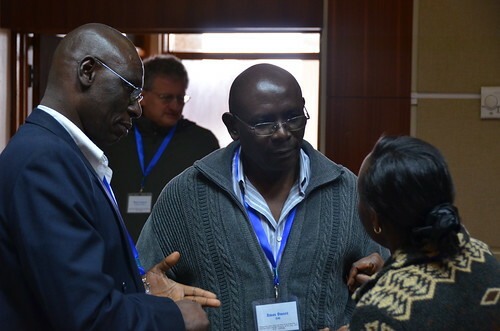 The rural economy is dominated by smallholder rain-fed farming and use of extensive common property resources. Nearly 56% of holdings are less than 1 hectare (2.5 acres) in size. 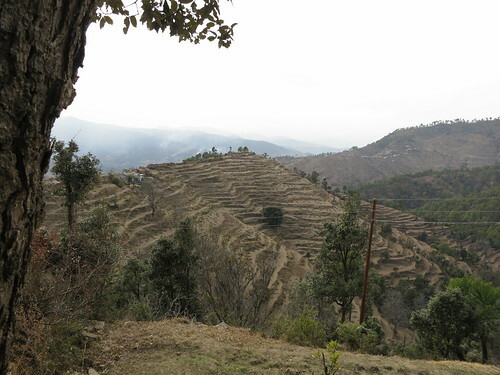 Most farmers here raise livestock and grow rice, although pulses, maize, wheat and oil seeds are also grown. Lack of investment in infrastructure (only 9% of the sown area is irrigated), poor extension services, lack of input supplies and services as well as a lack of training have led to low agricultural yields and very low incomes. The Sir Ratan Tata Trust, which has been funding rural livelihood programs in Jharkhand for several years, commissioned ILRI to undertake a study of the livestock sector to explore its potential for improving livelihoods in this state. As in the rest of India and other developing countries, the demand for livestock products in Jharkhand is increasing. With 90% of rural households in the state keeping livestock, there is a huge opportunity for these small and marginalized farmers to supply the growing livestock markets with livestock products. In areas around towns, the study found a booming demand for milk, much of which has been met by imports from neighbouring states, but peri-urban dairies are developing to supply the demand locally. 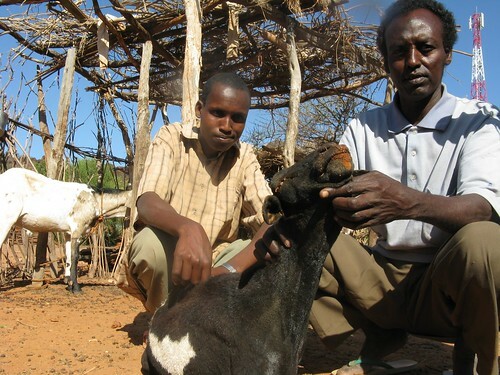 Assessing the results of surveys carried out in different parts of the state, the authors of the report recommend the following ways to overcome the technical, institutional and policy constraints to livestock development, especially among poor and marginalized livestock keepers: (1) tailor development programs to suit different ethnic communities and locations and build on the traditional skills and knowledge of local communities, (2) help livestock producers to access markets and improve their marketing skills, and (3) implement community-based programs to support livestock development. The report concludes that poor coordination among the key stakeholders in the livestock sector—from government officials to livestock researchers to staff of non-governmental organizations, banks, insurance companies and other financial institutions—is what is most hindering the development of the livestock sector. A main recommendation, therefore, is to establish a common platform, facilitated by the government, where key players can come together to exchange information and experiences and identify knowledge gaps. 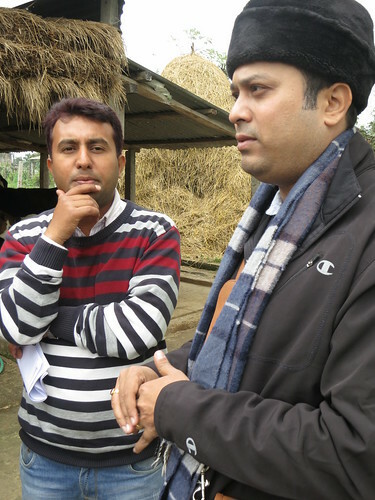 ILRI will be implementing some of the recommendations of the report in two new projects in Jharkhand. An imGoats project will work to strengthen goat value chains in Mozambique and India, including Jharkhand, and as part of an ELKS Project, ILRI is supporting an organization called ‘Collectives for Integrated Livelihood Initiatives (CInI), which is supported by the Sir Rattan Tata Trust, in the design of a new project to improve the livelihoods of goat and pig keepers. For further information, contact Iain Wright (i.wright@cgiar.org), the author of this blog post, or read the ILRI report by Rameswar Deka and Iain Wright: Potential for livelihood improvement through livestock development in Jharkhand, January 2011. 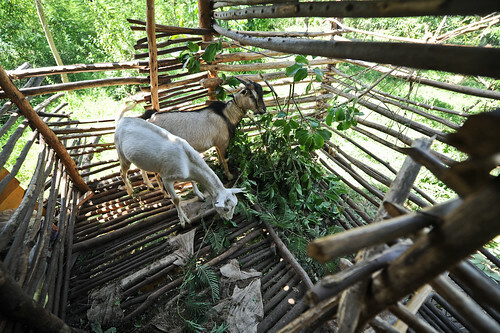 A survey in Western Kenya reveals that poor families move through six stages of progress out of poverty – from being able to secure food to purchasing a sheep or goat. 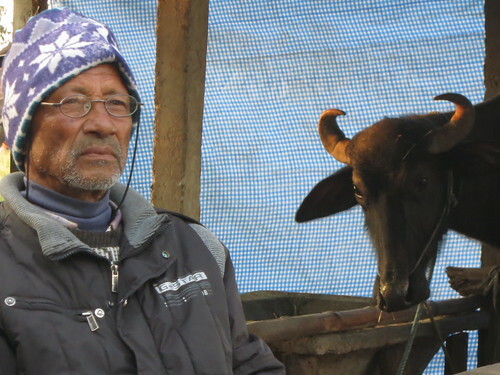 These stages highlight the relative importance of livestock to the poor. 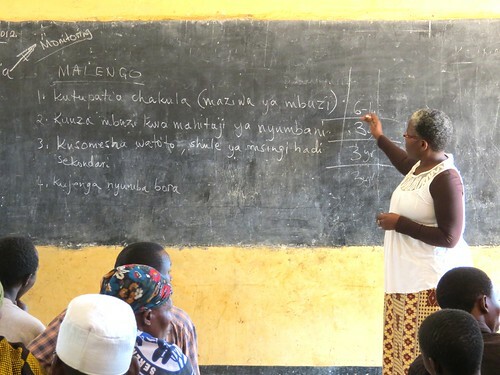 A recent study in Western Kenya has looked at Stages of Progress into and out of poverty as defined by the communities being studied. A common understanding of poverty was agreed with villagers, and the study found that families do not consider themselves poor if they progress beyond stage 6, referred to as the first poverty line – see below. 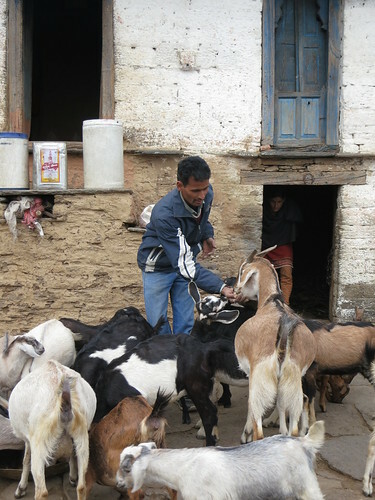 The results show the importance of livestock to the poor. 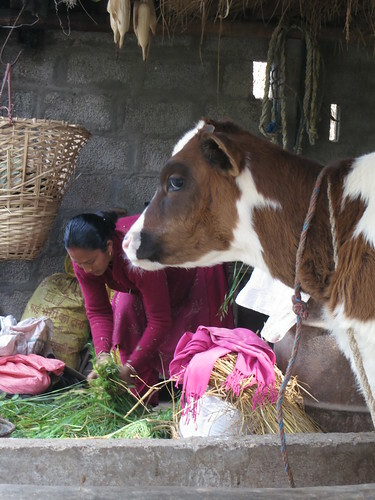 Livestock types are a key indicator of where families sit on the poverty scale. Owning chickens is viewed as the most basic level of livestock keeping. Chickens are an important source of protein in the diets of the poor – they can provide eggs that can be eaten and/or sold, or they can be sold or slaughtered for food. Chickens are relatively easy to keep, and are important to the poor, particularly to the many families predominantly made up of women, children and the elderly. 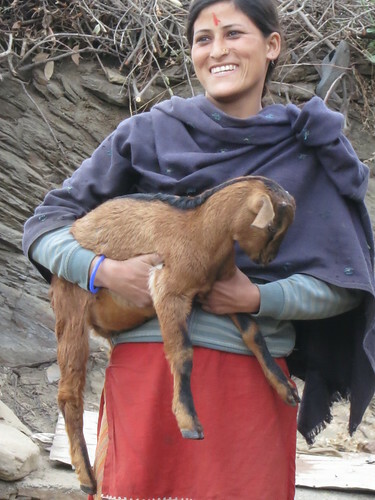 Shoats (sheep and goats) represent the next step up the livestock ladder – they provide milk and manure and are important protein sources in the diets of the poor. 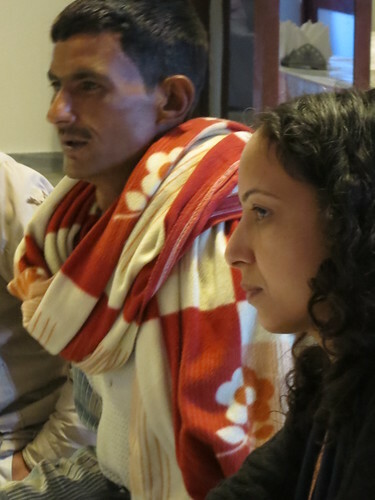 The study found that households that have not been successful in progressing beyond Stage 6 consider themselves to be poor and are commonly regarded as such by other villagers. Although there is broad agreement that most families progress through each of the six stages, and usually in the order defined, the authors noted that beyond stage 6, households tend to diverge in the later stages, for example, some may rent land before purchasing cattle. The purchase of local cattle is the next step up in the livestock rankings – in addition to being a food source, they also provide manure and draft power. However, cattle are targeted by thieves, and there are some examples of families being stripped of their assets due to persistent cattle thefts. 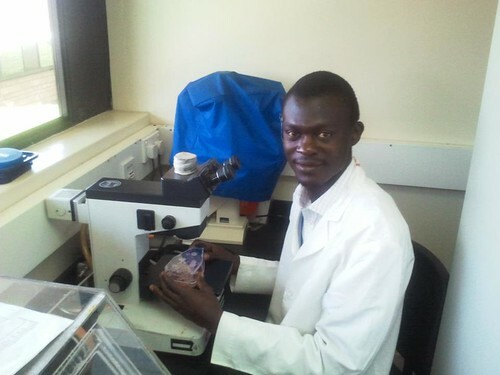 Cattle diseases are also prevalent in Africa, emphasising the importance of education in disease prevention and management. This is a key contributor to families safely remaining above the first line of poverty. The model neatly illustrates how the loss of a household’s cattle – whether it be through disease, thefts, funerals, or bride price – can propel a family back into poverty. At the highest level in the livestock rankings are dairy cattle, which provide milk for the family as well as milk that can be sold to earn income for the household. Those families who have dairy cattle sit above the second poverty line and are considered to be relatively well-off. 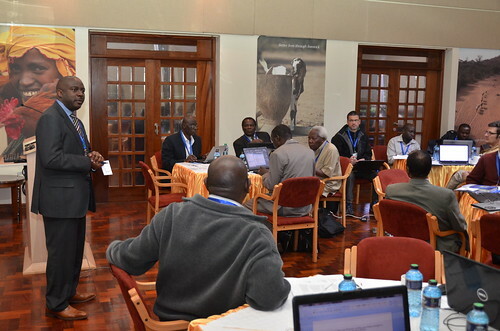 The study entitled “Pathways out of Poverty in Western Kenya and the Role of Livestock” was undertaken by scientists from ILRI, Duke University, and FAO. 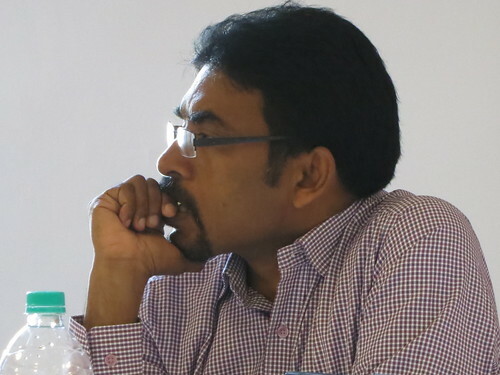 We thank the authors, P. Kristjanson, A. Krishna, M. Radeny and W. Nindo for granting permission to reproduce extracts.